After World War II, suburbs proliferated around California cities as returning soldiers traded in their uniforms for business suits. After-hours leisure activities took on an island-themed sensuality that bloomed from a new fascination with Polynesia and Hawaii. Movies and television shows filmed in Malibu and Burbank urged viewers to escape everyday life with the likes of Gidget and Hawaiian Eye. Restaurants like Don the Beachcomber and Trader Vic's sprang up to answer the demand for wild cocktails and even wilder décor. The culture—a strange hodgepodge of idols, torches, lush greenery and colorful drinks—beckoned men and women to lose themselves in exotic music and surf tunes. 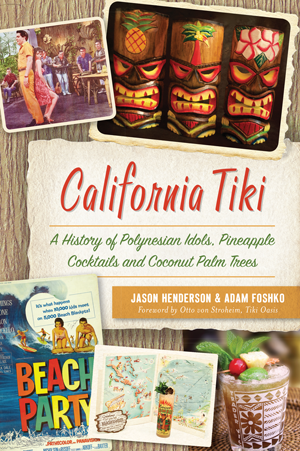 Authors Jason Henderson and Adam Foshko explore the state's midcentury fascination with all things Tiki. Jason Henderson has written games for EA, Microsoft and Activision. He is the author of the popular Alex Van Helsing series from HarperCollins and the 2019 series Young Captain Nemo from Macmillan. He wrote the magical romantic comedy Sylvia Faust for Image Comics and the assassin thriller Daughters of the Shadow for Marvel; co-wrote Clockwerx, a steampunk adventure about a Victorian mech team, for Humanoids; and co-wrote the teen adventure Psy-Comm for Tokyopop. This is his first nonfiction book. Adam Foshko has worked on some of the most successful media franchises in history. His experience as a writer and world builder has cultivated a deep understanding of why stories are important and their place in reinforcing culture, socialization, history and identity. He believes that Tiki has a similar power—one that calls to us from a much older world of mystery, binding us together in its rediscovery, playfully tempting us with the opportunity of escape and promising a tale of great adventure.